Hello! Welcome to Coffee & Blog. I am reaching out to share my experiences, stories and more as a young single parent walking through life, with the hopes that I can inspire you all! What better first post than that of my experience with trying to be a healthier person!? I will admit that I am not the most active person, I don’t watch what and how I eat (I love food too much LOL) and I prefer sitting around rather than getting out there! I have become such a hermit in my house with the exception of going to school and having to run errands that I see it’s affecting my son’s social experience. I have realized that he isn’t familiar with proper behavior out in public, and I blame myself entirely. That’s why I have decided to try and change my habits, I say try because I don’t know how many times it will take me to actually achieve this goal, which consists of many goals. But I have realized something… I can’t look at everything I need to change and seek to make all of those changes at once, I need to take it one goal at a time. Being that I am a big lover of food, I am not starting with that one just yet, HA! Here’s what I have decided is going to be my first goal. Exercising should be a part of my everyday life. Before having my son I was always out there enjoying life, felt great about myself too! But pregnancy to me was an excuse to get lazy I suppose and that’s when I went down hill. I tried the whole gym thing after I had him, but it wasn’t for me. Needing to leave the house and make free time and worry about my son being watched, the gym did not seem worth it, and I still feel that way. How else was I suppose to get my exercise in for the day?? I realized I could do it right at home, and my son could join in on the fun with me! I don’t jog, run or anything crazy like that so I figured I need to start small but still beneficial for my health. That’s when I decided to do.. I wish I could have gotten a snapshot of my son joining in on the deep breathing and amazing stretches, he was the cutest! He always asks me if we can do yoga, and that’s great motivation for me to take out that yoga mat and get my yoga in for the day. I always made excuses for myself why I couldn’t exercise but now we have made it a fun thing for us to do together, plus I feel amazing after and notice how my energy increases! I did some research online to try and find the right beginners yoga video to follow, because I had no idea what I was doing on my own LOL. My best friend who is seriously a yoga addict recommended a channel on YouTube for beginners yoga and more! 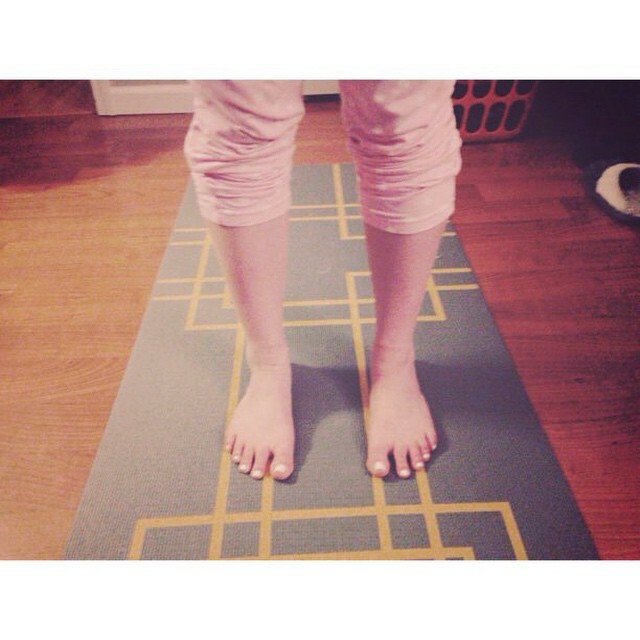 That’s where I found Yoga With Adriene. Initially I started out with Adriene’s Yoga For Complete Beginners – 20 Minute Home Yoga Workout! and it was pretty easy! That idea that it’s only 20 minutes really helped me get started, knowing that 20 minutes really isn’t that long, so I was able to push myself to get started! After the first time I noticed how great it made me feel! After a few days of doing that, I then moved on to Yoga For Beginners – 40 Minute Home Yoga Workout. Being that I was familiar with some of the stuff from the other video, it was an easier transition into the 40 minute workout. And then I attempted the Yoga For Weight Loss – 40 Minute Fat Burning Yoga Workout. It was a challenge but as expected, I felt great afterward! My plan is to continue with the yoga and just focus on that for now, until it becomes embedded in my routine and I feel no need to push myself to get started, then I will move onto the next goal. Remember, one goal at a time. Don’t overload yourself because that’s when things feel harder to accomplish! Yoga is good for the body and good for the mind, and the idea that you can do it in the comfort in your own home, free of charge makes it so much more enjoyable! Take that first step to a better and healthier you! Hello! My name is Amanda, mom of a little 4 year old energetic boy. I am a digital scrapbook designer, college student and true lover of life!